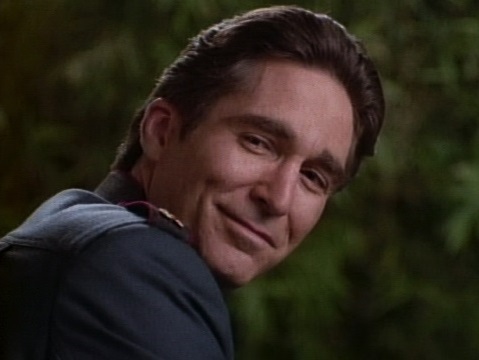 Back in 1994, with production of Season 1 of Babylon 5 completed, it was announced that the show's lead actor, Michael O'Hare, would be departing his role as Commander Jeffrey Sinclair. He would be replaced by Bruce Boxleitner, who would play the rather different role of Captain John Sheridan. At the time the show's creator and executive producer J. Michael Straczynski said that the reason for the departure was creative: it was straining credulity that, having established Sinclair having backstory connections to the Minbari in the first season, he would also have a connection to the Shadows in Season 2 (a story point given to Sheridan instead). It was also indicated that O'Hare was missing his life acting in theatre in New York and was finding working on a weekly television series in Los Angeles onerous. Later years saw more depressing reasons suggested: fellow actors from the show suggested that O'Hare seemed distracted or unprofessional, possibly on drugs of some kind during filming. Michael O'Hare attended occasional Babylon 5 conventions but had not made any public appearances for some time before he passed away in September 2012 after a heart attack. At a convention in Phoenix, Arizona, Straczynski fulfilled a nineteen-year-old promise by revealing the real reason O'Hare left the show. O'Hare had been suffering a debilitating psychiatric condition during the filming of the first season. He had good days and bad days, but getting the full medical treatment he needed would take much longer than the relatively brief hiatus between seasons. Straczynski offered to shut down production of the series so O'Hare could get the treatment he needed, but O'Hare refused to put the jobs of the hundreds of people involved in the making of the series at risk. Instead, O'Hare chose to leave and return when his treatment permitted to conclude his character arc. Ultimately, he reappeared in one episode of Season 2 and two of Season 3 to round off his storyline. Straczynski promised O'Hare to keep the reason for his departure to his grave, but O'Hare only asked him to keep it until he reached his grave. At the convention, Straczynski also spoke of the other actors from the show who have passed away: Richard Biggs (Dr. Stephen Franklin) was almost deaf and had to learn everyone else's lines so he could effectively lip-read his cues. Despite his disability, he was continuously enthusiastic and fired up about the show. Andreas Katsulas (Ambassador G'Kar) was diagnosed with lung cancer but refused to get depressed about it. One night, a few months before his death in 2006, he invited Straczynski to a 'last supper' and got him to 'fess up about all the behind-the-scenes dirt the actors never got to hear about. He remained jovial and convivial up until his passing. An audio recording of the appearance where Straczynski spoke about O'Hare can be found here. Man, that's kind of sad. Any word on what psychiatric condition O'Hare had? You know, this puts it all together for me. I posted about actually seeing Babylon Squared in Michael's apartment the night it aired, and I think I can corroborate all of this. Something was off with him, and we all felt it was simply because he was let go. According to the linked discussion-thread, towards the latter third of shooting O'Hare was increasingly suffering from 'delusional episodes' with 'paranoia'. Despite which, he still had the class to put the show and its crew ahead of his own place within it. RIP, Michael - you earned it. Thanks for a nice piece, I recently competed a Babylon 5 rewatch and despite the dated sets and CG it still holds ups. It's so sad that somany of the cast have passed away, especially when you compare with other sf shows (most of the original Star Trek cast are still going and that was aired in the '60s). It really adds an extra layer of melancholy to the show, especially duiring the final episode 'Sleeping in Light'. Thanks so much for this information. B5 just keeps on giving. We're just doing our annual (and sometimes biannual) rewatch. Thanks to JMS for his integrity and his vision. Thank you to all the ones still with us - how much you have given us with your wonderful performances. B5 Forever! Wow, I had no idea. I really respect J. Michael Straczynski's integrity in keeping Mr. O'Hare's privacy intact for nearly two decades. As a fan of the show with its mythology, this adds a sad, John Donne-esque resonance. I liked Mr. O'Hare's meditative, almost Zen-like approach to his character--especially considering his eventual unveiling as Valen. I only just found out he passed on, joining others such as Mr. Katsulas, Mr. Biggs, and far too many in going beyond the rim. Can't but be choked up. Journey well; you live on in the mythology of a poignant universe.